Budapest UNESCO World Heritage Riverside May Events & Things To Do in Budapest Events, concerts, tours and other spring activities in Budapest in May: get ideas for the top things to do and see. Bath Parties Budapest Bath Parties in Budapest every season: winter, spring, summer or fall, the bath party brings a splash of fun to any gloom! Szechenyi Bath in Budapest Top 10 Szechenyi Bath winter fun: 18 thermal pools, whirl waves, massaging jets, span treatments in the City Park awaits you in Budapest all year round. Market & Food Tours in Budapest Budapest Market & Food Tours: small group, high quality tasting and market tours. Budapest Restaurants: the Best Places to Eat Eat well in the city of Budapest: see the top restaurants, eateries, romantic places to eat. Room Escape Games in Budapest Be a detective and solve logical puzzles to get out of the room: like computer games but in real rooms in Budapest! Fun, team building, genuinely engaging! Margaret Island: the Beautiful Park of Inner City Budapest Enjoy Nature in the city of Budapest on the picturesque Margaret Island. Visit the ruins, the giant fountain, bike cart or bathe! December Things To Do in Budapest Events, Festivals, concerts and other winter activities in Budapest in December: see the top things to do! The top ten things to do in Budapest is by no ways an easy list to put together as there are lots of things to do, to see, to try in the exciting capital city of Hungary. Admittedly, it’s not easy to pick the overall top ten things to do in Budapest, which would cater for all interests, styles, ages, tastes and budgets. If you have specific requests, and would like to get some more personalized tips for your Budapest Top Ten, send your comment (see the hundreds of comments below). When in Budapest, go to a bath. But why does everyone tell you that? Well, Budapest baths are one of a kind. Really. They are palaces, or historical Turkish baths. Soak, have a lazy morning, and get some massages in one of the best Budapest Baths, like Szechenyi Bathsor Rudas Baths, or in Gellert Spa. Having a healing bath is not only good for your joints, it is also a great way to get back your strength after stress, late night parties, long Budapest walking tours, or to cure your jet lag. The top baths in Budapest have a range of thermal and swimming pools of all sizes, so everyone can find their own needs easily. Some of the baths are mixed fully, or at least co-ed on certain days: see more on Budapest Baths. Try one of the therapies and drinking cures too. Does it taste strange? You bet. But it’s hot spring water cooled down. Nature’s cocktail. Tip: the lines waiting at the Szechenyi Thermal Baths can be quite long from May to October. Is it worth waiting 45 min in the hot sun (no shades!)? We don’t think so, after all you can buy your Szechenyi Bath tickets online. Winters are OK though (except Budapest Christmas holidays and NYE), as are weekday mornings, if you can optimise your bath visit. Tip: Nightlife seeking tourists shouldn’t miss Budapest bath parties, ‘sparties’ short for spa parties (laser beam show, VJs, and spa party mix! ), the Saturday Magic Bath parties and the summer Szecska bath parties! Are you already hooked? Give a like to Szechenyi Baths on Facebook. The once famous Buda Castle labyrinth has been closed down for good, and then re-opened as an apparently lame version (you have been warned) under a new concept and management. Tip: Buda Castle festivals are some of the best Budapest festivals, there is one for almost every month: Easter Festival, Wine festival, Chocolate Festival, Beer Festival, Palinka Festival, etc. Don’t miss the Festival of Folk Arts in the Buda Castle around Aug 20. Tip: If you like WW2, visit the Rock Hospital Museum: a nuclear shelter + hospital under the Castle Hill. Feel the chilly winds of the Cold War era. Visit the Heroes’ Square featuring the historical equestrian statue complex called the Hungarian Millennium Monument. The square is flanked by two high-quality fine art museums, the OLD and the NEW. The classical Museum of Fine Arts features the old arts, from mummies to Raffaello – huge fine art collections from Europe – see the exhibitions at the Museum of Fine Arts.) Opposite the Museum of Fine Arts is the contemporary Hall of Arts (Mucsarnok) if you love good exhibitions of international arts from the last few decades, it is a must see. Alternatively, take a walk in the City Park (where Szechenyi Baths is), spot the Vajdahunyad Castle at the artificial lake. The small lake by the castle is good for feeding the ducks, or skating in winter, boating lake in summer. You can keep walking on Andrassy Avenue (or take the yellow line metro to Oktogon square) and take a look at the House of Terror, a highly popular and unique museum showing the real dark pits of communism, and the Nazi regime in the ex HQ of the secret police. Tip: check out the weekend flea market at PECSA if you like oddities, quirky items and places. Kertem is one of the ruin pubs in the City Park (snacks, drinks, good atmosphere). You can buy gifts, try the delicious fresh vegetables and fruits, Hungarian paprika, salamis, etc. and gobble the Hungarian savory snack, ‘Langos’ in the Great Market Hall of Budapest by the Liberty Bridge in Budapest. There are good food stalls and an affordable restaurant too. To get unique gifts, or to shop for Hungarian artsy specialties go to WAMP Design Market or Gozsdu Court in the old Jewish quarter. WAMP is once a month (in summer by Deak Square). Tip: Here is a simple Budapest shopping map: wine shops, cheese shops, designer shops, Budapest market halls, etc. OK, it is actually the number 1 or 2 thing to do in Budapest, but you will be walking by the river anyway. Also our tip: walk along the Danube promenade, marvel at the neo-Gothic Hungarian Parliament with its fine turrets and statues. Walk through the Chain Bridge, the Liberty Bridge, or the Margaret bridge (Margithid), and take a fun bike to go around Margaret Island, (Margitsziget) one of the best green parks of Budapest with loads of things to enjoy (open air lido of Palatinus, free pet zoo, Japanese garden, etc.). Tip: Budapest is a city where you will walk a lot. If you get tired, get on Tram 2, which is among the top ten most scenic tram routes in the world (National Geographic), and voted as the best in Europe. Tram 2 runs along the river Danube, which is basically like a free river tour on land. Budapest Segway Tours: if you are already a Segway fan, you need no more encouragement, just go, and enjoy. If you have not tried rolling on a Segway yet, here is a chance to get instantly hooked! Available in winter too. Bike Tour in Budapest: 3.5 hour bicycle tour in the city, including the river Danube and its beautiful promenades. Cruise on the river Danube in Budapest is best at night, after or in sunset. Boat tours are very varied. For the best guided river cruise in Budapest, pick the panorama boats (glass covered, like Duna Bella or Legenda). Simple sightseeing cruise sound boring when it comes to options like: cocktail cruise, wine cruise, beer cruise, party cruise, lunch cruise, dinner cruise, NYE cruise, Christmas boat, etc. Budapest boat tours: get in a river boat (some are open air, others have huge glasses to shield you in rainy windy weather), and sip some nice champagne, wine, beer or juice while enjoying the night-lit UNESCO world heritage sights of the two sides of the Danube: the Buda Castle, the Citadel on the Gellert Hill, the 19th century buildings on the hilly Buda side, the Hungarian Parliament, the Gresham Palace, the St Stephen’s Basilica on the Pest side, the Margaret Island and the bridges (Chain Bridge, Liberty Bridge, etc.) in the middle. You cannot but be romantic in Budapest. 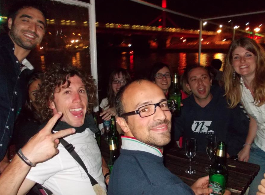 Or just warm up for a party on a Budapest boat party. Enjoy operas in the beautiful Hungarian Opera House (snacks in the break are also a treat) and/ or listen to classical concerts at the Franz Liszt Academy of Music or choirs, organ concerts at the magnificent St Stephen’s Basilica. Jazz, world music and classical concerts are excellent at the Palace of Arts (MUPA) where you can always find something intriguing to do. If classical music is not for you, go to one of the great Budapest festivals (e.g. Sziget Festival on Obuda Island in Budapest, Balaton Festival in Zanka Volt Festival in Sopron, etc.). For cool local and international rock, world music, jazz, metal, hiphop, d&b, metal, punk, etc. concerts visit A38 music club (which is a ship on the Danube with a nice restaurant), or check out some fresh music programmes by talking to guys & gals in a pub/ cafe – everyone will be happy to help you. The younger generation of 15-38 speaks good English. Visit the Dohany Street Synagogue (aka the Budapest Great Synagogue), the Jewish Museum, and the old Jewish district, where you can try yummy cakes at Cafe Frohlich or Cafe Noé etc. (Rachel’s Flodni is incredibly delicious). If you are lucky you can listen to some wonderful klezmer music, and other concerts at the Synagogue. Don’t miss the Jewish Summer Festival if you are in Budapest in August-September, or the Jewish Gastro Festival in November. Walk through Kiraly street (start from Deak square) to find a good place to eat, boutiques to buy handmade things, and feel the vibe of a Budapest’s Jewish community. 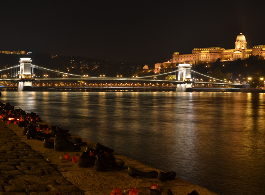 Take a walk to the Shoes on the Danube Holocaust memorial by the river bank on the Pest side. Tip: the Jewish Quarter in Budapest also boasts most of the hip and trendy bars of Budapest, the so called ruin pubs. Walk along Kazinczy Street to bump into a dozen of the ruin bars. Take part in Budapest nightlife: lots of parties, pubs, bars and clubs. Budapest definitely caters for all tastes and inclinations, dancing and drinking habits. Plus the city is quite safe even at night, and people are very friendly. But use your common sense: after all it’s a city of 2 million people. Enhance your nightlife experience by checking out one of the best Budapest festivals. Ruin pubs (like Szimpla kert, Otkert, Corvinteto, etc.) are not to be missed if you are under 35 or so, and love parties, cool pubs, artsy – quirky places. You will know what to do: talk to locals and have fun, try a sip of palinka, or a Hungarian (craft) beer! Tip: try some of the drinks we locals take: the best Hungarian beers, sample the best Hungarian wines, take a few sips of the Hungarian dessert wine Tokaji aszu, or the mighty Hungarian Palinka will set the mood for any parties. Try Hungarian cuisine in one of the best Budapest restaurants, or one of the Top Budapest cafes, especially the mouthwatering cakes at the best Budapest confectioneries . When sampling Hungarian dishes, supposing you are not a vegetarian in Budapest, give priority to goose (Hungary is the second biggest goose liver exporter following France), mangalica pork (the meat of the Hungarian furry pig), or duck, wild boar. Did you know that many Serrano hams in Spain are made from the best tasting Hungarian pork, Mangalitsa. Try the matching Hungarian wines, but do not trust all waiters / sommeliers (some will offer you the priciest, so if in doubt, check the price before ordering). Are you on a tight budget looking for value and cheap restaurants? Don’t despair! Here are some of the best cheap restaurants in Budapest (green icons on the map show vegetarian options). Leave some room for the best Hungarian pastries for dessert. Dobos cake may be famous, but it is a dry cake. ‘Flodni’ on the other hand, is the best moist cake ever! Hungarian strudels at Retesbolt are fantastic, worth a detour. Cakes at Daubner are also singing! Try a tasting tour on hot summer days in cool wine cellars, visit the market halls with a local foodie guide, or if you love cooking, try one of the best reviewed Hungarian cooking crash courses. Top Geek Things to Do in Budapest: tech savvy, geek, nerd things in Budapest, the innovative hub in the CEU region. Please help us keep updated. If there are any changes in the above, send your comment in.